Baptism is a rite which places you as a member of a congregation. These are common statements one will hear from many Christians from traditions who doubt the full teaching of baptism. It does seem foolish that God would use a weak thing like a splash of water to do much of anything. To maintain that position I had to deal with several passages of scripture that state otherwise. he saved us, not because of works done by us in righteousness, but according to his own mercy, by the washing of regeneration and renewal of the Holy Spirit, whom he poured out on us richly through Jesus Christ our Savior, so that being justified by his grace we might become heirs according to the hope of eternal life. One of the first misconceptions about baptism is whose work is it? If it were merely the work of man than indeed it would have little or no change in a person’s life. The first phrase indicates to us the following activity saves us by Our Lord’s promise. This promise is carried out by the use of a person to apply water and invoke the name of God. It is then that we realize this is not a work done by us in righteousness but it is God pouring out of the Holy Spirit. This is understood because Jesus said to baptize in the name of the Father, Son and Holy Spirit. And just as the words spoken by him created all that we see and do not see we can trust this promise as well. This gift justifies us by his grace and we receive this justification through faith. This is the way we receive the gift of the forgiveness of sin by the Gospel being preached into our ears. It is another means that the Spirit uses to deliver the fruit of the cross to us. 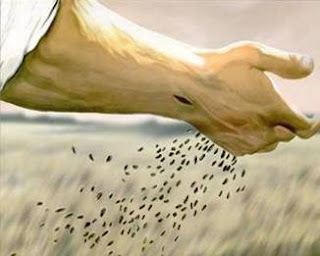 Jesus Sowing His Words For You! People approach the word of God in one of two ways. Either they have a belief and look to validate it or get their beliefs from study. The former use is the natural use. We all want to think our ideas are original or we like what we hear so that is accepted at face value. The latter, scripture as primary source, takes much more effort. It requires one to place beliefs under the microscope for objective evaluation. The following passage is presented by several different groups as an explanation on why some are saved and others lost. Okay. This looks like a reasonable use of the text: When one sows seed the receiving ground must be prepared ahead of time. The type of seed spoken of here would be the type that produces grain such as wheat. The seeds are very small and scattered as opposed to put into holes or troughs in the soil. The ground that is well prepared ahead of time is the one to produce the fruit. Some will say the people mentioned in most groups did not prepare themselves for the message. Others will say a preacher did not soften them up with the law enough. Still others say the sower did not care about those people who are not receiving and producing. Is this what Jesus was teaching? Was he really trying to explain why some are not saved? 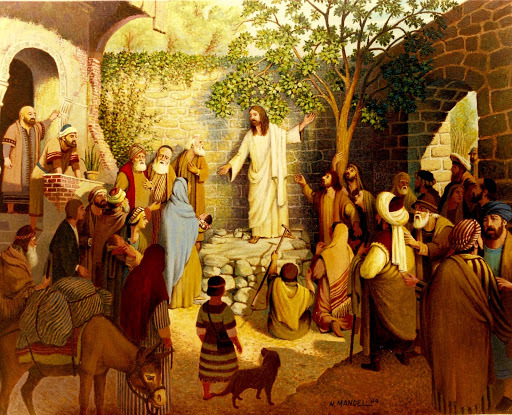 Just like all the parables, Jesus is the subject. Jesus is the sower spreading his words into people’s ears for their salvation. Those who will not listen — men and women who will obstinately refuse the free gift of salvation in favor of saving themselves, atheists who convince themselves no God exists, and people who are scandalized about a Creator who will actually die for his enemies — will spurn Jesus’ cross. Travel the more difficult path to understanding scripture which is so straight a child can grasp it. It is incredible the good news of Jesus would prompt us to ask questions of morbid curiosity rather than praise Our Lord for his powerful words. In The Gifts of Endless Mercy and Faithfulness For You!! There are two things are bad with chronic illness. The first is, you do not feel good. I’ve often thought that if one felt better, illness would not be so bad. That sounds silly, but back in the good, old days illness would happen and then in a short time I would feel better. This made colds, the flu, etc., not so bad. With chronic illness one either feels bad or worse. Living with a constant barrage of bad news tends to wear on a person. This can cause both sleepless nights and dreams which are most troubling. If not for the wonderful gift of God’s word one could easily despair of life. One would not think to find such wonderful comfort in a book that has the label of lament. Reading this book one will see woe, despair and judgment. These are brought about by Our Lord to his people. It seems counter-intuitive to go to this same Lord for comfort and mercy. However, that is the reason for the Lord to chasten us. To drive us to him and away from ourselves and others we think can help. There are times when I read scripture and it seems as if this is new stuff. It seems through the changing themes in life the mercy we have as a gift is brand new. This is fantastic rather than disheartening. The Holy Spirit is in the word, creating faith, leading in righteousness and comforting beleaguered souls. Jesus promised this gift before he ascended to the Father. Foolish and Weak For You! Two things that are admired and idolized in our culture are strength and to have something make sense. When something does not make sense it is thought to be merely foolish and of no lasting good. If something appears weak it is despised and rejected out of hand for the same reason. God indeed demonstrates his strength by holding all creation together only by his desire to hold it together. He has mercy on all people by curbing our impulses to consume each other. He also limits the calamity that can befall us from our surrounding environment and even our own bodies due to disease. The greatest example of God’s strength comes in the crucifixion of our Lord. This is done in weakness in order to supply eternal life to all. But this appears to be weakness to the eyes of unbelief that need and admire strength. The Creator of heaven and earth is a victim of a huge injustice on the cross. This is foolish to the wise one. It is foolish to think the crucifixion of one man has anything to do with forgiveness of sin. Only faith can see Jesus was there strongly and wisely carrying the burden of the sin of all. Jesus has instituted what appears to be weak and foolish means of grace to deliver the fruit of his cross to the sinner: A man proclaiming the guilt we all share for falling short of the glory of God, then proclaiming forgiveness in the name of Jesus saves us. Then he opened their minds to understand the Scriptures, and said to them, Thus it is written, that the Christ should suffer and on the third day rise from the dead, and that repentance and forgiveness of sins should be proclaimed in his name to all nations, beginning from Jerusalem. The weakness of having the words of Jesus flowing into our ears, and that those words will save us seems ridiculous to those outside of Christ. There is nothing flashy like bright lights and lots of noise, only the loving words from Jesus that our sins are forgiven for his sake. This belief has fallen on hard times in the Church. Proclamation of the Gospel has been replaced by hints for happy living. Sermons now include a whole list of things that have nothing to do with salvation. Suggestions on how to go out there and become successful at all sorts of endeavors. All things from financial well-being to information on how to win a debate with other believers is touted as a Gospel. The Gospel is also said to include an ever increasing holiness in life. Yes, a believing one in Jesus will seek to live holy. Financial success is desirable. These things, although admirable from human points of view, will not save. Only the preaching of our guilt before God for what we have done and left undone will lead to repentance and the forgiveness of sin. Due to our falling short of the glory of Christ we live in constant need of repentance and the forgiveness of sin. This is provided to us by the cross of Jesus and delivered to us through the proclamation of the Gospel. I capitalized the word from to indicate what he emphasized when reading that verse. What we see here is a scene from heaven after the resurrection of the dead. This is where the church catholic is gathered from all time and all nations. Yes indeed those were ransomed from every tribe, language, people and nations. What it clearly does not say is that those who are in attendance were the only ones died for. Those who refuse to trust in Jesus’ perfect life, death, burial and resurrection do not receive these gifts. That in no way indicates that those gifts are not theirs or that God in no way wanted them to have eternal life. This is a sadness. Due to his or her own stubborn refusal to believe in Jesus, that instead of eternal life, the unbelievers are entering into eternal death. Many believers that I have talked to have loved ones and friends who are great folks but have a steadfast refusal to trust in Jesus. What these dear ones are trusting is in his or her own goodness. That if there is a god in their thoughts it is a false god who will weigh the good against the bad and all will be swell. Still others have children who were raised in the faith but have rejected it for various reasons. This can cause hours of tears in concern and prayer for these children’s eternal salvation. This is similar to the charge Adam had against God for the woman God gave him. Eve had the similar charge against God for the serpent God placed in the garden. Interesting to note, in the record of that exchange the serpent did not pass the blame along to anyone else. He seemed pretty cool with all of it. God does not explain in his holy word, apart from unbelief, why even though Jesus died for all sinners why some are saved and others lost. Father is merciful to his children so we can go ahead and pray boldly and cry for our lost family and friends. Jesus did not die in order to send people to hell. We pray he will grant all true repentance and faith in Jesus. Trust this good news and live in the peace that it gives.